After buying some bits of chicken and some bread, we headed out of town, our letter from the Governor in hand, confident we would finally be able to leave Gabon. Driving past the customs office at the edge of town, a guy ran out into the street and stopped us. He claimed to be the customs officer and wanted to stamp our carnets, except that he didn’t have a stamp. If you’re an official in Africa without a stamp you might as well not even exist. He wrote out some bits of paper which he stapled into our carnets using a stapler he borrowed from us and told us that customs charges 10,000 CFA per vehicle. We argued with him for awhile and eventually Elsa and Vicky went off to find the prefecture who had been very helpful in getting our letter from the Governor. We all sat around on the barrier at the customs office for a half an hour or so. Eventually two cars drove up, and the prefecture got out of one of them along with his entourage (everything requires many people to follow the boss around). He had a few words with the customs guy, who, looking very unhappy, tore the bits of paper out of our carnets and let us through. We drove for 30 minutes to the military checkpoint to speak to the guys with the AK47s. We showed them our letter, but they were not impressed, saying that they needed military authorization to let us through. The chief jumped into a pickup to go back to Bakoumba to talk to the colonel. We set up our awnings in the middle of the road and settled down in the shade to make tea. By lunchtime the chief had still not returned, so Elsa got out her laptop and we watched a movie (Ice Age). 90 minutes later the movie was over and still no sign of the chief. We used the sat phone to call the US embassy and spoke with an attaché there who promised to try to help, but really there is little he can do. 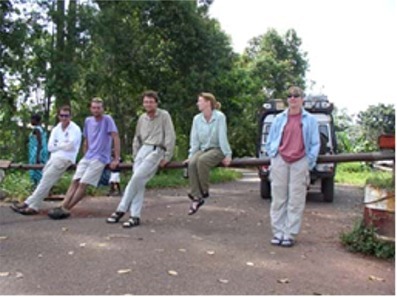 Witt, Urs, and Elsa drove the 30km back to town in the Pinzgauer to try to locate the chief. They found him drinking beer and waiting for a ride back to his post. We loaded him into the Pinzy and started back. Apparently he had made good use of his trip into town as he reeked of beer and was obviously loaded. We had to stop once on the way back so he could pee. He told us we could go, which we did with haste. We believe that he never spoke with any colonels at all and that the whole thing was a ruse so he could go into town to drink. By the time we left it was after 4pm. We drove the last 15km to the border and arrived there just after 5pm. This border, we were told, hadn’t been open since the Congolese civil war in 1997. The border itself is a couple of steel gates secured with padlocks on the Gabon side and a strategically placed rocks on the Congo side (we walked across while no one was looking to check it out.) There was a footpath between the gates, but it was obvious that there hadn’t been any vehicle traffic through in some time. We showed the border guard our very official letter from the Governor. First he told us that we could not cross because the man with the keys to the lock on the gate is dead. We wondered if the keys had been buried with him, and if so could we go and dig him up? We explained that we could easily cut the bolts, so he next had to invent a story about there being no reference number on the letter from the Governor. The whole group is getting rather fed up with all the bulls**t; All we want to do is get out of Gabon. We set up our tents at the border and made a dinner of chili and rice. Tomorrow we plan to phone the prefecture on the sat phone and ask for his help. The Gabonese border guard dressed for work in his uniform this morning, something he probably doesn’t have occasion to do very often. After we broke camp, Elsa went to speak with him. The “reference number” problem had mysteriously disappeared, but for some reason we now had to wait until the Congolese agreed to let us in before he would let us out. The Congolese, he said, would be arriving on foot, and would take longer than normal today because of the mud. Last night we saw an amazing thunderstorm. It started with lightning in the distance, far enough away that we couldn’t hear the thunder. By 3 am it was raining hard and it continued until almost dawn, leaving our campsite a muddy mess. 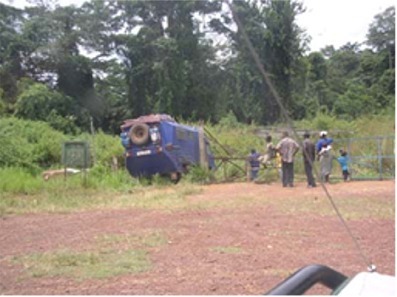 At about 10am a truck drove up on the Congo side of the border bearing about a half-dozen people, including another down-on-his-luck Nigerian and a German man who was traveling by public transport to Libreville. We were told that we had to return with them to see the chief in Mbinda, the first town we would encounter in Congo. Jen, Graham, Elsa, and Vicky piled into the pickup with Graham and Jen in back next to a guy with an AK47. The rest of the group settled in for more waiting. We pored over maps and a detailed report from someone who had recently driven from Namibia to Point Noir. He had spent about 14 days on the journey and recorded towns, distances, and drive times. There are three sections in particular that seem nasty, requiring a full day’s drive to cover 100 km. Connie’s parents are due in South Africa at the beginning of May, and we are starting to be concerned that we won’t make it there in time to meet them. About two hours later the truck returned from Mbinda. Elsa (who is French and has helped us out tremendously in talking with officials and locals) convinced them to allow us to enter, and in fact reported that the Congolese are very excited to welcome the first tourists in 7 years into Congo via their border. Graham got his bolt cutters and cut the lock on the Gabon side of the gate, having decided that was easier than digging up the dead guy to retrieve the key. We drove through 100m of tall grass to reach the Congo side of the border. The officials stamped our passports at the border, then we followed the pickup 10km to Mbinda. The road was very slow and there were many deep mudholes filled with water from last night’s rain. Toki got mired once as the dead spot in the steering makes for some tricky driving. A quick tug from the Pinzi got us moving again. The prefecture in Mbinda gave us an extremely warm welcome and was happy to have us in his town. We walked down the main street to buy bread, bananas, and some dough balls for lunch. The locals seemed astonished to see us. As we left they all (about 40 people) stood in the street and waved. As we drove along toward Myoko, we received similar looks of amazement from the people we passed. We passed a man in a military uniform who told us we had to check in at a nearby police post. They were all very excited to have someone whose passports they could inspect, and whose details they could copy down. We spent about 30 minutes there and were set free. The road continues to be muddy and rutted and we’ve seen only 3 vehicles all day. 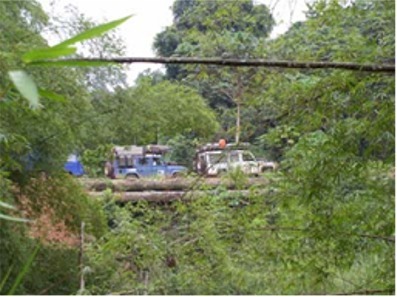 The track is slowly being overtaken by the jungle and at times there is a wall of vegetation scraping along both sides of the car. We drove through a section that was strangely flat and devoid of trees, although the grasses were still higher than our cars. Connie checked Fugawi and found that there was once an airstrip there! Fortunately it is marked “unusable” on our map. We eventually found a spot to camp after a bit of searching, although it was quite muddy. We built a fire and Slade grilled some chicken for dinner. He seemed disappointed that he couldn’t think of anything else to write. After he inspected our carnets, he told us that we had to go to see the police next. The entire process was repeated with guy tasked with searching the cars absolutely terrified of Bio the Schlobberhund. “Is he tied??! !” Next we were told we had to visit the military post and afterward the Mayor wanted to see us. Most of us have papers with all of our details on it that we can just give to the police to save them lots of effort and us lots of time (although they aren’t always accepted) and we gave these to the military official, who didn’t notice that there were two missing. We got in our cars and drove off as quickly as possible, blowing off the mayor and heading out of town. This had taken a good part of the afternoon, and a further two police checkpoints in the next 20km stretched our patience further. At one we were introduced to the district prefecture who was at the bar drinking beer and could barely stand to shake our hands much less copy down any details. In fact all the officials seemed to be at the bar. We drove a further 80km in the afternoon to the office of a logging company owned by a friend of Elsa’s family. They put us up for the night and even fed us dinner, quite a feat considering that there are nine of us. We were glad of the shelter as we watched a full downpour and thunderstorm from the verandah. The little buggers give quite a bite if they crawl onto your foot.